Logan was born and raised in Quincy, Illinois. His parents owned a large farm and several small businesses and instilled at an early age the importance of a good work ethic. Logan attended the University of Kansas and graduated with a Bachelor’s of Arts in History, he then attended Villanova University to study philosophy and theology. Logan has always know that the keys to success are hard work and a good plan. Prior to joining Frisco Financial Group Logan was a field Agent with the Knights of Columbus where he enhanced his Life Insurance, Annuities, Long Term Care, and Disability insurance skills. 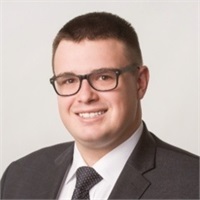 Logan is ready to make sure that his clients are protected now and are actively prepared to achieve all of their financial goals through their life. When he isn't helping people plan and protect themselves, he can be found outside. Logan loves to cycle, participate in triathlons, fish, and hike. Logan once did a 53 day bike ride across the United States!